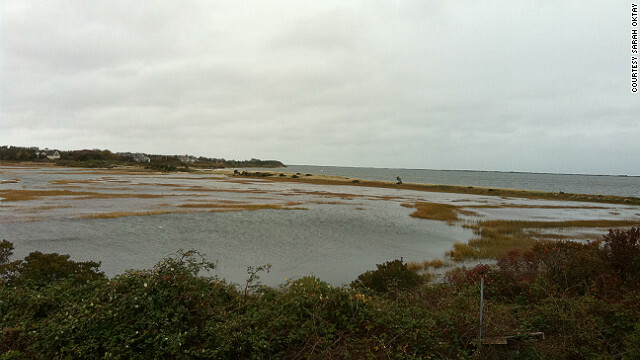 Folgers Marsh in Nantucket Harbor, October 28, 2012, helped protect nearby buildings from the surge caused by Hurricane Sandy. (CNN) - The next Sandy is coming. Not tomorrow. But sooner and more often than we’d hope, say the experts, at least in part because of climate change. What provided that safety was a barrier between the energy of Sandy and her building. The barrier was not concrete. It was nature-made, one that, like the martial art Tai Chi, absorbs the energy of an attack rather than blocks it. And when you listen to Sarah Oktay on this CNN Profile, you’ll know how imperative it is to create more of these natural barriers along the U.S. coast if we are to become more resilient to the Sandys in our future. Anyone living near the coast or planning to move to a coastal area must get familiar with what Nantucket oceanographer Sarah Oktay is about to teach us. It could make the difference between absorbing the blows of a future Sandy with minimal pain, or getting knocked out.